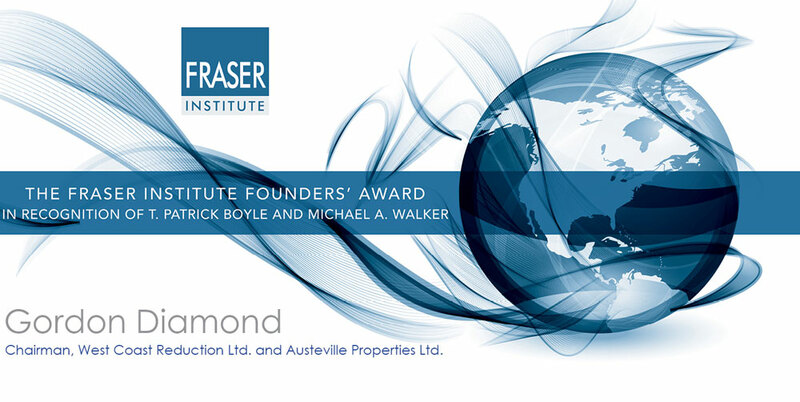 The Fraser Institute Founders’ Award, in recognition of its founders T. Patrick Boyle and Michael A. Walker, is the Institute’s highest honour. The award is presented annually to individuals in recognition of their exceptional entrepreneurial achievements, generous philanthropic endeavours and dedication to competitive markets. Past recipients include exemplary Canadians such as Richard Jaffray, Keith and Ryan Beedie, Chip Wilson, Brandt C. Louie, George Melville, Jim Treliving, Darren Entwistle, Norman Keevil and Peter Brown. Please join the Fraser Institute in celebrating Mr. Diamond’s contributions to Vancouver and Canadian businesses. In previous years, Vancouver attendees have been very generous with their support which has been instrumental in ensuring each honouree is celebrated in a manner fitting of their contribution. We hope that this year you will help us continue that tradition. To purchase tickets or tables please register or download the purchase form. Gordon Diamond is the Chairman of a group of companies which includes West Coast Reduction Ltd. and Austeville Properties Ltd. West Coast Reduction Ltd. owns and operates rendering facilities in British Columbia, Alberta and Saskatchewan. Austeville Properties Ltd. has an extensive real estate portfolio located mainly in Vancouver. The head offices of West Coast Reduction Ltd. and Austeville Properties Ltd. are in Vancouver. Gordon graduated from Magee High School and went on to attend UBC, and subsequently UCLA (University of California, Los Angeles) where he graduated with a Bachelor of Science degree awarded by the faculty of Business Administration in 1960. He joined the family business, J Diamond and Sons Ltd. after graduating, and worked for Pacific Meat Company before that company was sold in the early 1960s. Having acquired a background in the meat packing industry, Gordon worked with his father and his brother, Charles, to found and build West Coast Reduction Ltd. As a far-sighted builder and entrepreneur, Gordon initiated the construction and development of new rendering plants in Vancouver, Calgary, Lethbridge, Edmonton, Saskatoon and at Duke Point on Vancouver Island. These plants, all state of the art, had the capacity to absorb the rapid growth in volumes of raw materials that West Coast Reduction Ltd. received from meat packers unwilling to commit large capital sums needed to replace their own aging rendering plants. Gordon took time off to attend, on a part time basis, an Owner/President Managers Program at Harvard University. The program lasted for three years, at the end of which Gordon received a certificate of graduation from the Harvard Business School in 1988. Applying the lessons he learned from Harvard, Gordon initiated a period of transformation in his own companies. Recognizing the dangers inherent in a family business that does not plan for the future, Gordon implemented and reinforced succession plans by allowing younger family members and professionally qualified staff to assume more responsibility and he encouraged and supported the implementation of technological changes to cope with the exploding new era of information technology. Despite his great success as a businessman, one of Gordon’s proudest achievements is the Diamond Foundation which he set up in 1984 with his late father, Jack Diamond, as a vehicle for his philanthropic aspirations. His philanthropic passion is shared by Leslie, his wife of 57 years. Since its inception, the Diamond Foundation, funded solely by Gordon and his companies, has made donations to hospitals, schools, the arts and other public and charitable activities. In 1999, Gordon was the recipient of an honorary Doctor of Laws degree, Honoris Causa, awarded by Simon Fraser University. In 2007 he was awarded the Order of British Columbia.